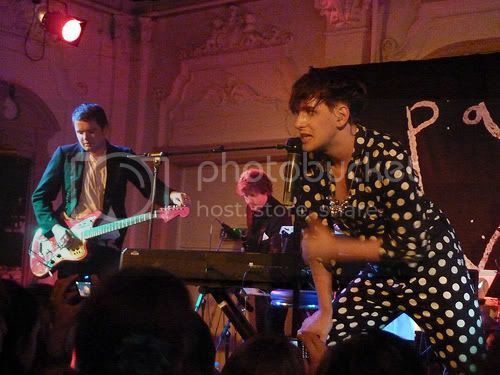 Location: Bush Hall Date: 05/08/10 Photos: Magnus Bush Hall was the venue Patrick Wolf chose for his first outing since his theatrical show at the Palladium in Londonâs West End back in November. Since then the ever changing singer-songwriter/pop-star/multi-instrumentalist/troubadour/folk poster-boy (delete whichever you feel appropriate) has been recording his fifth album, The Conquer, the second part of Battle, with last years The Bachelor being the first. The sold out gig was in far different surroundings to Novemberâs spectacle, this was far more intimate. Each album sees the Londoner change both in sound and vision. With the forthcoming record yet to be completed it was a low-key event, no ridiculous costumes and gimmicks for distraction, it allowed Wolf to shine along with his new found confidence and happiness. Arriving onstage in a smart suit jacket and short black hair with a smartly dressed backing band the singer seems to have grown-up a lot. Sipping water onstage and apologising for accidentally swearing, is this him preparing for the big-time? Opening with 2009âs âHard Timesâ Patrickâs vocals have become stronger than ever, this became even more noticeable as he delved into all parts of his career. He avoided showcasing any new material that would have ended up on YouTube via a badly recorded video from a camera phone. Highlights included âTristanâ, the first ever live performance of âVultureâsâ b-side âThe Tinderboxâ and happy birthday sing-a-long to his mother. His stage talk was charming and humbling as he admitted his shame of his behaviour of earlier years, this was a fresh start. Iâve seen Patrick Wolf nearly thirty times and no two shows have been the same. Sometimes he can be over-the-top-camp, he used to be painfully shy but he works best when he is just himself. This seemed to be one of his most comfortable professional performancesâ and with a back-catalogue as strong as his it baffles me why he has never managed to break into pop-stardom. If he keeps out of trouble and this new record is up to standards it might be his time to win the war he started in his childhood.